Rossignol Studio introduces Barbariz II, a barrel organ library for Kontakt. 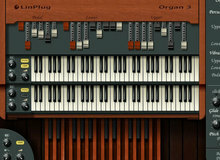 Rhythmic Robot has released OrgaTone 601, a Kontakt virtual organ based on a Casiotone model. Air Music Technology reissues two virtual instruments formerly designed by DigiDesign, the Mini Grand piano collection and DB-33 organ. Toontrack completes its EZkeys virtual keyboard collection with a pipe organ recorded in Sweden in a 13th Century church. Sonokinetic celebrates Halloween this weekend with three Pumpkin Packs, each featuring three sample libraries. Lorenzon, Rhythmic Robot’s new virtual instrument for Kontakt, is a collection of samples of a reed organ.